FULL, FIRM. AIR-TOUCHED FULL COVERAGE. Meet the foundation brush designed to make skin look like skin. The Full-Bodied Foundation Brush 110 is the ultimate tool for applying Pro Filt’r Soft Matte Longwear Foundation. This full coverage foundation brush was made to give you the quick coverage of a flat paddle brush plus the seamless blending of an airbrush. In other words: Fast coverage with an air-touched finish. 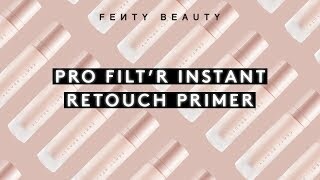 For the ultimate coverage, press foundation brush into skin, roll off, and repeat—Rihanna’s go-to method. FULL-BODIED FOUNDATION BRUSH is rated 4.7 out of 5 by 221. Rated 5 out of 5 by Ahumphrey519 from Great brush I bought this about a month ago and i love how it applies. Well worth the splurge. Rated 5 out of 5 by Sherlick from Happy ..never disappointed I love everything I've I am always satisfied with Fenty products ..and keep in mind that's I'll be 65 this September:)! Rated 5 out of 5 by Jasrad from Love ittttt I’m more of a beauty blender type of gal but this brush really does its job and the foundation blends perfectly! Rated 5 out of 5 by noemiguz from Love this brush Very quickly became my favorite brush to apply foundation - I even purchased a back up. Rated 5 out of 5 by Ashley29 from Absolutely amazing !! I purchased this brush a month ago I was kinda skeptical but I am so glad I did !! The foundation looks flawless with this brush !! Rated 5 out of 5 by CLOUDWALKER from Wonderful brush I use this brush for my concealer, it blends perfectly. Rated 5 out of 5 by Georgiana1313 from The best foundation brush I've tried so many foundation brushes with the Fenty foundation, but I've now only realized that this is the best brush for applying foundation. The skin looks natural, soft and with a natural qlow. I also feel like I'm getting a face massage with how soft the bristles are. Applying foundation is now a joy.